Are you graduating from college this year? If so, there’s some good news. According to a recent survey by the National Association of Colleges and Employers (NACE), employers are planning to hire 9.6% more graduates in the United States than they did in 2014. Additionally, 55% of survey respondents plan to increase their hiring numbers this year, up from 46% in the fall of 2014. Michigan State University also conducted a survey that revealed 97% of employers will hire at least one new college graduate in 2015. Express Employment Professionals recently released a study on the top 10 cities with the most unfilled job openings. To find out which cities made the list, click here. Now that you know the careers and skills employers are looking for, how do you make yourself the top candidate for open jobs? Forbes advises that you visit your school’s career services offices before graduation and ask for advice on networking, internships, and organizations within your field of study. Networking with students from your school who have already graduated in the field you’re interested in can also be beneficial in your job search efforts. Those graduates have already been in the workforce for a few years and may have tips of the trade you could learn. Visit your school’s career services offices for assistance finding alumni who can help. Even if you’re not graduating in 2015, it’s never too early to get a head-start on finding a job after graduation. As early as your freshman year, you should consider visiting your school’s career services offices and begin networking. Remember to keep your grades up and try to find internships and extra-curricular activities that would interest an employer. Joining the debate team, helping with a political campaign, or being part of the advertising club can help you stand out on your resume. Additionally, volunteering your free time in your community can also set you apart from the rest of new graduates. 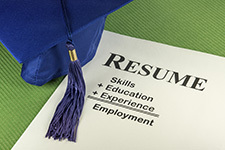 The hiring outlook is bright for new graduates, so how do you plan to land a job after graduation? Share with us in the comments section below!